Cooling down in the Fish. Its sheer Size. Its Grandeur, Grace, History and Time… all make hiking in the second-largest canyon in the world an adventure of epic proportions. 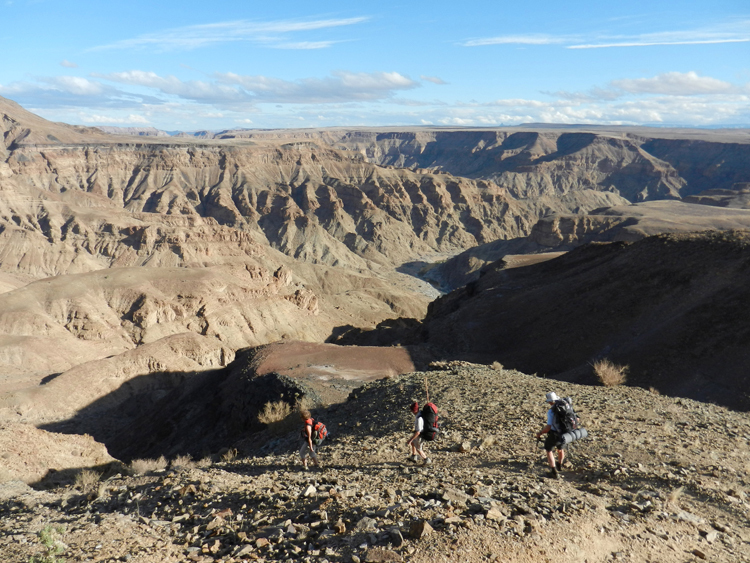 The Fish River Canyon is 549 metres deep and covers a distance of 90 kilometres to its end at Ai-Ais. Its widest point measures 27 kilometres. It is considered to be the second-largest canyon in the world after the Grand Canyon in Arizona, USA. I focused on every step, my legs trembling as I grasped even harder onto the hand chain to begin the 90-kilometre trail. Curling down below like a large, slithery green serpent, the Fish River continued its eternal passage of cutting through the canyon walls, drop by drop, ripple by ripple. Soon the climb down (and my heart) gained a gentler rhythm and I looked up more frequently to witness the grand cathedral of rock that was now catching golden flares of sun in the late afternoon light. Reaching the river, I sighed, craning my head to look back up to the viewpoint perched high above like an eagle about to take off. And so began the adventure of watching the constellations travel across the night sky and the morning brighten and lighten until the canyon walls shone gold once again and it was time to pack up and walk southwards. 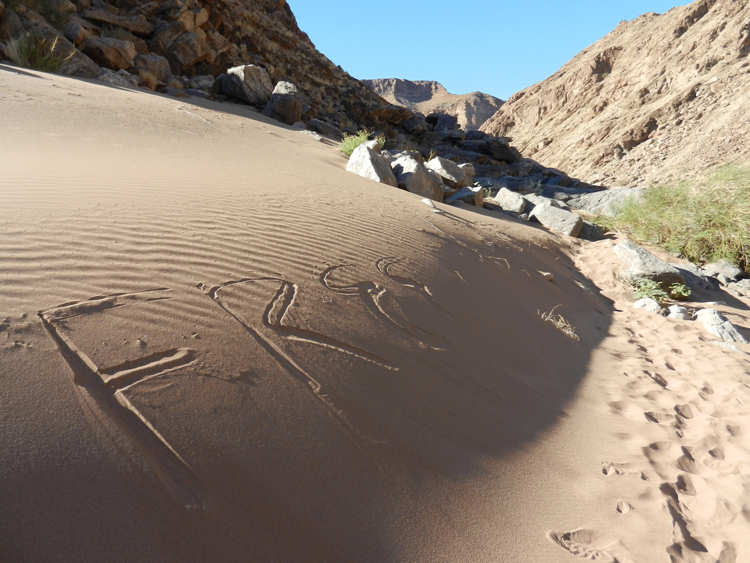 … Amidst this natural treasure, two of the fastest walkers in the party scrawled words on the sand that were apt for the journey – peace, love, trust, patience and passion, messages that added to the powerful experience. We settled deep into the soul on the afternoons when we swam in the cool water reflecting rock castles, lay in the sun like fat lizards, sat in the warm, muddy waters of the hot spring, laughing like children, and later watched the stars twinkling in the light of a crescent moon. The canyon widened, opening its rough, gnarled hands in generosity, becoming greener, with more animal tracks etched into the river banks. 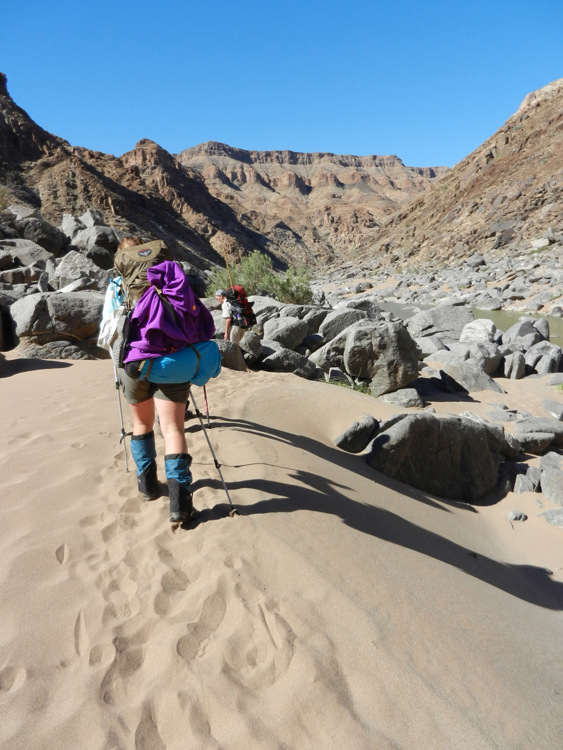 The rocky route transformed into sandy stretches and river-rock carpets, and there were more river crossings to negotiate. We hopped from rock to rock, balancing on the small slippery stepping stones, or took our off boots to dip our toes into the water. Short cuts took us over dry hills into an arid Never-Never Land dotted with quartz and marked with cairns, far from the singing water, and then returned us to the aquatic lifeline fringed with green. The German Soldier’s Grave, Fool’s Gold Corner and Fish Eagle Pools… We found our last wilderness landmarks in a happy hiking camaraderie. Muscle stiffness was overcome, blisters were bandaged and the last vestiges of civilisation’s stresses dissipated as our life batteries were recharged. This was an adventure that dipped deep into the recesses of our beings. We allowed it the time, watching other hiking parties rushing past. 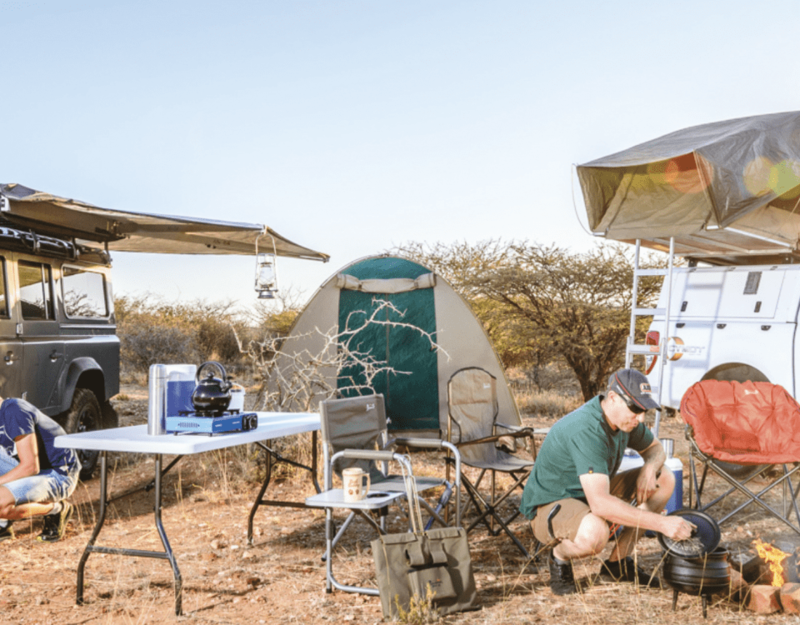 On the last day’s walk (day six of the trail), we made our way across the final bend of the Fish River and its sandy beaches before arriving at the Ai-Ais Restcamp where we had left our cars parked under a thorny tree the week before – or was it a century ago? Although the slow geological formation of the canyon walls began many millions of years ago, it is thought to have been born of a tectonic event when the earth’s crust subsided along faults, forming a ‘Graben’ or trench. 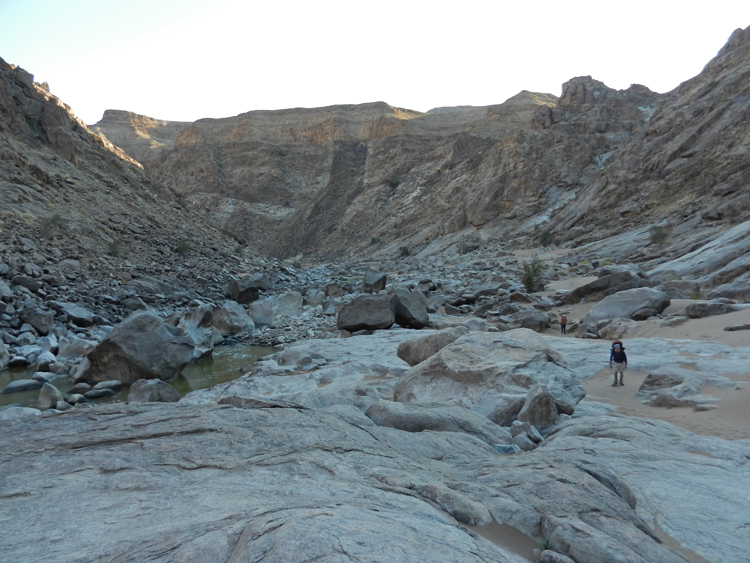 This was the easiest route for the Fish River to follow, slowly beginning the erosion of the canyon with the endless patience of eternity. hen Gondwana began to break up 120 million years ago (Africa and South America drifted apart only 60 million years ago), it lifted up the continental edges to form the younger and deeper part of the canyon. 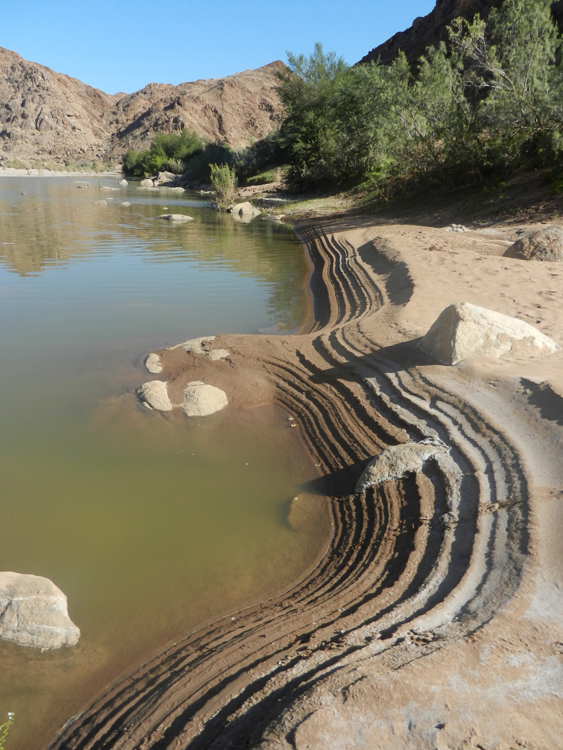 This gradient allowed the Fish River to flow faster, its swirling waters further carving out the canyon. In the last few million years, the river cut through the hard quartzites of the Nama group to reach the ancient gneisses of the Namaqualand Metamorphic Complex. For a visitor with a geological bent, it is possible to see this incredible record of history etched in the canyon rock. For those with less of an inclination, the vast time periods cannot but astound and increase the feeling of awe for this geological marvel. Several viewpoints give the visitor different panoramas over the impressive canyon depths. The main canyon viewpoint has a newly built shelter with picnic tables and information boards, providing a view of a horseshoe bend in the river. Hikers Point, the beginning of the trail, extends three kilometres to the north and to the south, and Sunset Point, Rocky Point and The Edge lead to the Sulphur Springs viewpoint, eight kilometres down the stony road. 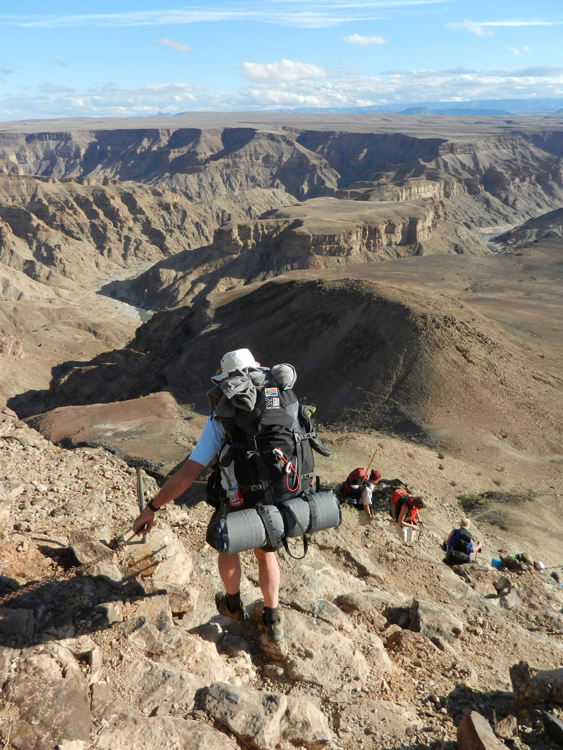 And that you come with a sense of wonder, as you will be having a true Namibian wilderness experience!